Need a few more bouquets or centerpieces? Click here. 1 Bridal Bouquet: 5-7 Black Magic roses, 3-4 cream spray roses, 3-5 burgundy carnations, sprigs of thistle, 3-5 dark burgundy scabiosa, 3-4 chocolate queen annes lace, 3-4 Safari Sunset, sprigs of agonis, seeded eucalyptus, and nagi. Pinterest Inspo Pic. 4-5 Bridesmaid Bouqets:2-3 Black Magic Roses, 1-2 cream spray roses, 3-5 burgundy carnations, sprigs of thistle, 1-2 dark burgundy scabiosa, 1-2 chocolate queen annes lace, 1-2 Safari Sunset, sprigs of agonis, seeded eucalyptus, and nagi. Pinterest Inspo Pic. Bouts or Corsages: Use sprigs from all the greens, thistle, and add cream spray rose bud or burgundy scabiosa. Pinterest Inspo Pic. 10 Centerpieces, 5'' diameter: Green first with agonis, seeded euc, and nagi. 5 Black Magic roses, 2 burgundy scabiosa, 2-3 Quicksand roses, 2-3 burgundy carnations, 2-3 thistle sprigs, 2-3 chocolate queen anne’s lace. Pinterest Inspo Pic. 18-20 Mason Jar or 3'' Vase: 3 Black Magic roses, 1-2 Quicksand roses, 1-2 burgundy carnations, 1-2 burgundy scabiosa, sprigs of thistle and chocolate queen anne’s lace, and sprigs of agonis, seeded euc, and nagi. Pinterest Inspo Pic. 50-60 Bud vases: Each one will look different. I average 2-3 blooms per bud vase and a sprig of green. These are the flower allotted for buvases: 50 Black Magic roses, 25 Quicksand roses, 20 stems burgundy scabiosa, 25 burgundy carnations, 2 bunches of thistle, 2 bunches of chocolate queen anne’s lace, agonis, seeded euc, and nagi. Pinterest Inspo Pic. Here's our Dark and Moody Pinterest Board that inspired this combination of flowers. We hand-selected predictable and year-round flowers that will be easy to work with, and give you the same or similar vibe that's happening within these moodboards to take the guesswork out of it! 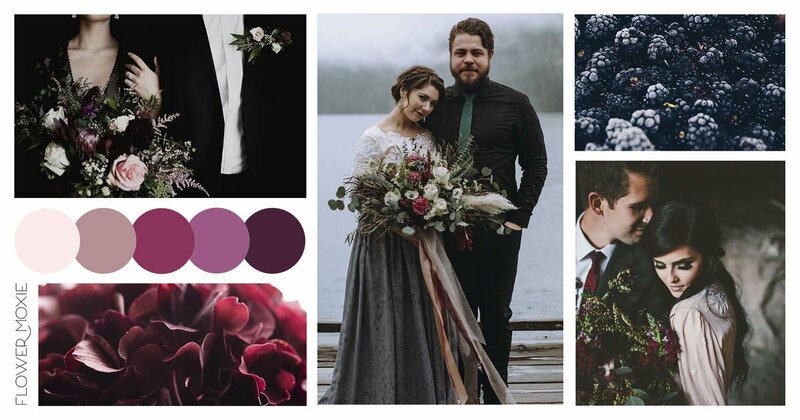 The Pinterest Inspo links are not an exact replica, but a great visual image of similar colors and flowers pulled together to help with the "...but what's it all gonna look like together?" question.